Having received a basket of Brazilian limes back along, I needed to start using them. This really wasn’t an issue as I do have a particular penchant for limes. One of the first things I made was based on the recipe for Lime and Coconut Cake from one of my favourite baking books, Cakes by Pam Corbin. Coconut and lime are a natural pairing and I think the flavours work to remind us over here in dear old Blighty that there is a tropical paradise somewhere. Adding a note of cardamom just seemed like a good idea at the time, although I was debating using ginger instead. Of course I had to get a little white chocolate in and I did. Pam’s recipe is a gluten free one, but as I didn’t need to do that, I went for low gluten rather than no gluten. Creamed 175g unsalted butter (left on the heater for half an hour to soften) with 175g cardamom (caster) sugar until pale and airy. Grated in the zest of three well scrubbed limes and creamed some more. Beat in 3 duck eggs, one by one. Sifted in 125g flour (75g wholemeal spelt, 25g coconut flour, 25g white) with 1 tsp baking powder. Stirred this into the mixture as gently as possible. Added 50g desiccated coconut and mixed gently again. Added 50g chopped white chocolate. Spooned into a 2 lb loaf mould (which I put inside a loaf tin to stop it bowing out) and baked at 180C for 45 minutes. Whilst cake was cooking, juiced the 3 limes and added 60g cardamom sugar. Left to dissolve, stirring occasionally. As soon as the cake was out of the oven, spooned the lime juice over the cake, then left in the mould to cool. The cake was utterly scrumptious, zesty and moist with a lovely chewy texture from the coconut and little caramel bites from the white chocolate; it was definitely a notch up from a standard lemon drizzle. Because it was so moist, it tasted just as good several days down the line as it did when it was freshly baked. I’m sending this cake over to Javelin Warrior’s Cookin w/ Luv for his Made with Love Mondays, a weekly challenge where anything can be made, but it needs to be made from scratch. As limes are in season, I’m also submitting this to Simple and in Season, a monthly challenge founded by Ren of Fabulicious Foods. This month is being hosted by C of Cake, Crumbs and Cooking. How beautiful are those limes?! Your loaf sounds so delicious, and love the glorious golden colour of it. I’ll be day-dreaming about this at elevensies! Thanks Hannah. I was so pleased with the colour, just what is needed to cheer us all up at this time of year. Hope your elevensies weren’t too disappointing. Looks so delicious and well done! You know just how to make a girl feel good Dom. Hope you do try it, it’s a real winner. Sometimes, quite often in fact, I think I need a brain transplant. There was of course white chocolate in the cake and I’ve amended the post to reflect that now. This cake sounds wonderful and that basket of limes is just gorgeous, what a fabulous way to use some of them! Thanks Jayne. A basket of limes goes a long way, I’ve used quite a few now and there are still loads left. Looks fab, but all I can think of now is that ‘put the lime in the coconut and drink ’em both down’ song … ah, the connections the brain makes, huh?! Hilarious! I didn’t think of that and now I can’t get it out of my head. I hadn’t heard this song before or even Harry Nilsson, but I did have a very sheltered upbringing 😉 That has all changed now, I’ve been enlightened. Hopefully, my cake won’t give anyone bellyache. 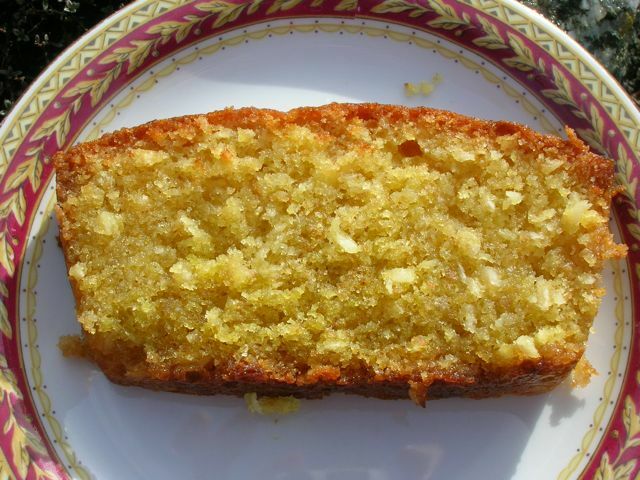 I’ve never put lime in cake before, bet that was nice and tangy! It look lovely and moist. Thank you. Limes are so worth trying out in cake, give it a go. Laura, I bought mine in Greenlife in Totnes, but any good health food shop should stock it. They have a wonderful array of flours as well as lots of other interesting ingredients. What a beautiful loaf, love how golden it looks and I would enjoy the coconut and lime combination. Thank you Mich, it tasted wonderful, but the colour made it particularly appealing – need all the sunshine we can get at the moment. Makes me think that summer is coming. Looking forward to lots more lime recipes if that gorgeous basket is anything to go by. Thanks Angela. Today, it seems as if spring has retreated, so it might just have to be sunshine in a cake. I’ve used loads of limes, but there still seems to be an awful lot left. I will be posting another couple quite soon. Haha, yes a second slice is just what you want people to have. It’s even more subtle when used in sugar format, but it really does add a certain je ne sais quoi. Oh that looks lovely and delicious flavours. What flour or ground nuts etc did Pam use to make it GF? So moist! The texture looks amazing, Choclette, and I love the combination of lime and coconut in the cake. I’m trying to imagine how cardamom would taste with these two as I’ve never had the combination, but I’m a fan of cardamom so I’m imagining it would taste delicious… Thanks so much for sharing! Thanks JW. As the cardamom has only infused the sugar, it’s quite a subtle taste, but I think it works well. What a beautiful looking loaf (or cake)! I love the idea of coconut, lime and white chocolate combined. Thank you. It tastes lovely and those three flavours make for a really good texture contrast as well as flavour combination. But mostly, at the moment, it reminds me of sunshine and warmth and is this very welcome. Fab looking loaf, so moist and crumbly. Love the combination of flavours. Thanks Galina, it was a good one and I will be making it again. Coconut is one of the wonders of the world. This sounds gorgeous! Coconut and lime really are an amazing pairing. Ginger would be my first thought. I’d never think of cardamom but it sounds wonderful! Thanks Hazel. Ginger would have been good as well, In fact after this one, I made a ginger and lime curd cake and it was a great combination. I adore coconut in breads and cakes, this looks divine, will have to give it a go! Coconut and lime: I could not think of a better combination. You have made a delicious cake Choclette! All this talk of limes is really making me crave them! This looks like a delicious cake Choclette – beautifully moist and I can just imagine how fragrant and delicious it must taste! Amazing flavours and a wonderful looking cake. I love these kind of deceptive loaf cakes, they look so simple but pack an incredible punch – fragrant, moist and original! This cake looks delicious! I’ve never tried coconut flour before, but might give it a go since I expect it has a more pleasing texture than dessicated coconut. this sounds like my sort of recipe, and would adapt easy for us. why duck eggs? More baked goods should have cardamom in them, much underused in my opinion.